I just can't do it. I just finished a really good book, so reading something that doesn't even reach okay...it's just not going to happen. 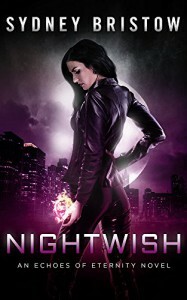 I picked "Nightwish" up because I was an Alias fan, and and the authors' name caught my eye...but the writing just doesn't work for me, and the heroine irritated the crap out of me...First she's attacked, then learns that demons/vamps/shifters and other Para creatures exist, and finally that she's been lied to for years by the most important person in her life, and that she has a secret family all the while she thought she was all on her lonesome...and through it all, she's totally and completely chill... she barely freaking reacts! she's sorta snarky, and sarcastic, but otherwise she barely responds to world altering news...so yeah, i'm too annoyed to read any more.